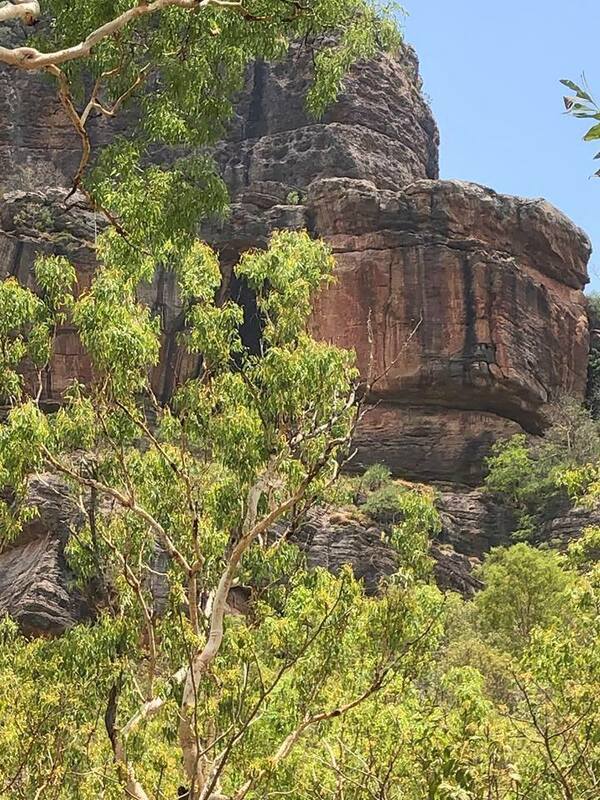 Nourlangie is a popular site to view Indigenous Rock Art in the heart of Kakadu National Park. 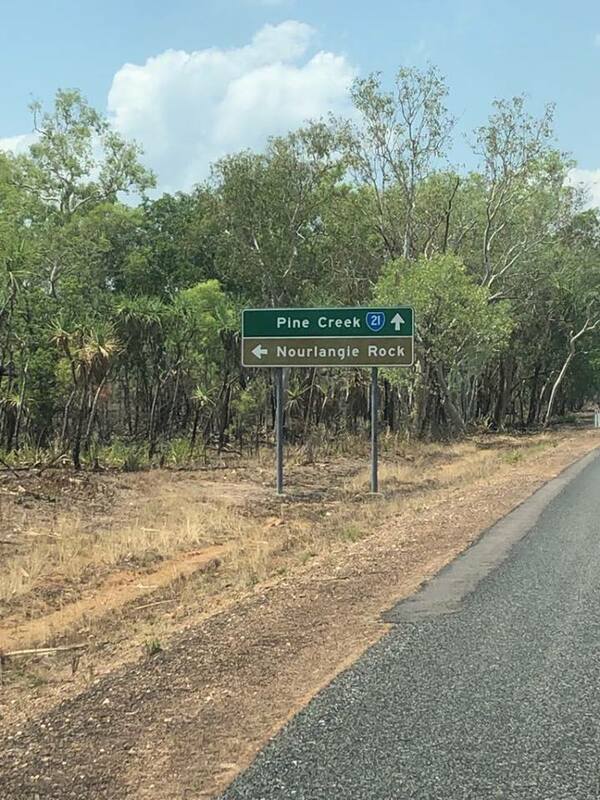 Nourlangie is located approx. 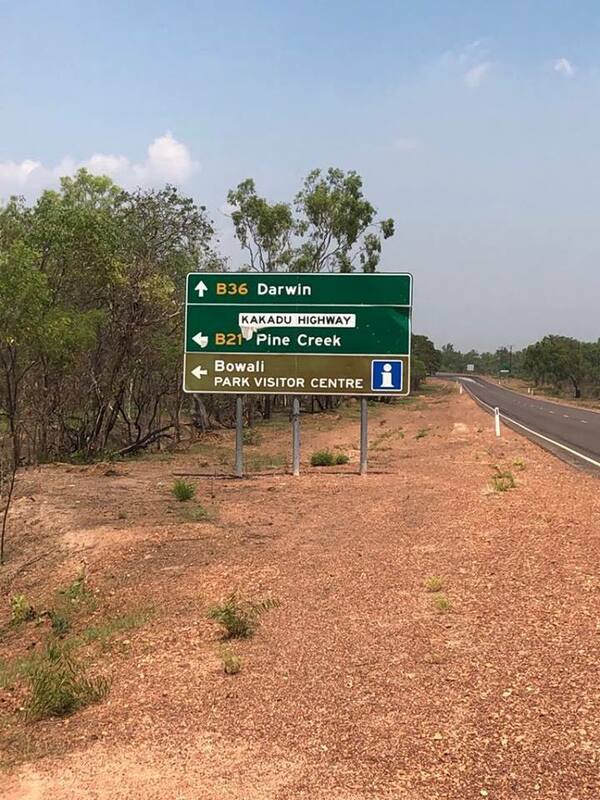 36km’s from Jabiru. 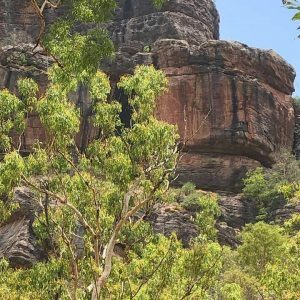 Nourlangie Rock Art Site is a popular site to view Indigenous Rock Paintings in the heart of Kakadu National Park. 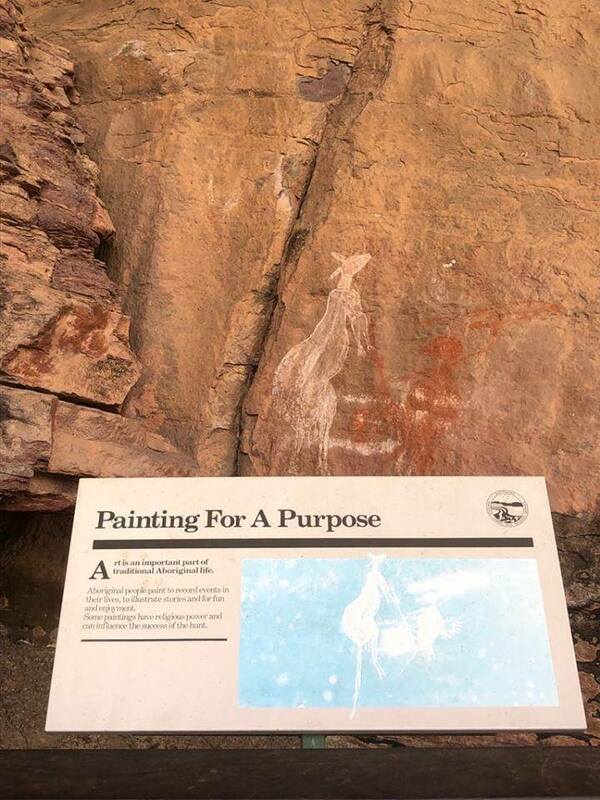 Many paintings and drawings depict Aboriginal life over thousands of years and reflect the connections between people and the land. 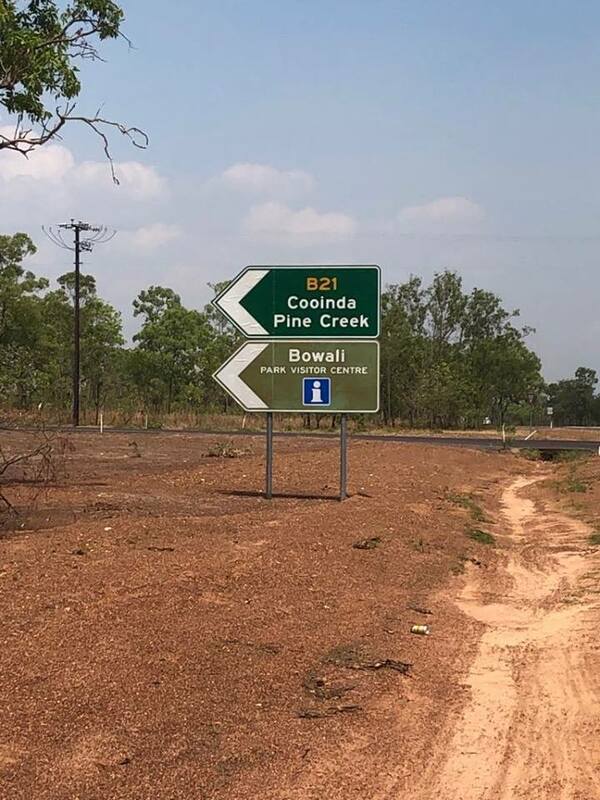 Nourlangie provides a unique perspective of a place known for providing shelter to Aboriginal people, particularly during the volatile and ferocious wet season. 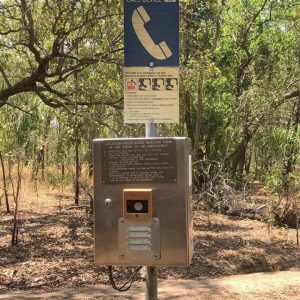 Throughout the dry season at nominated times throughout the day Park Ranger’s lead incredibly engaging tours, sharing their in-depth knowledge of the sacred sites. 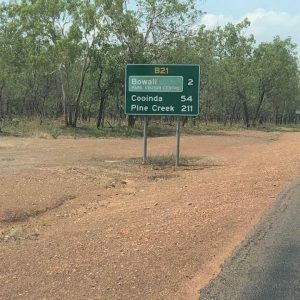 Nourlangie is located approximately 36 km’s from the township of Jabiru. 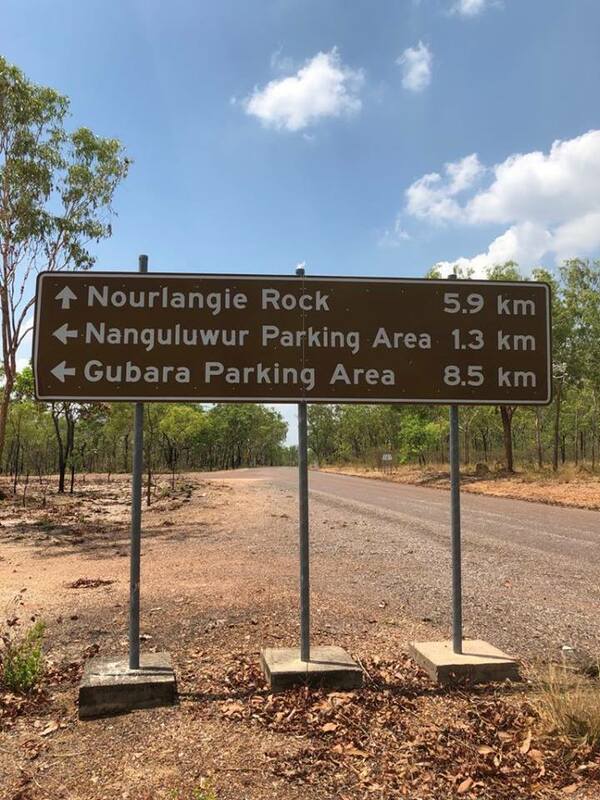 On entering the site there is a large car park and clear signage will direct you to a 1.5 kilometre circuit walk, known as the Nourlangie Rock Art Walk. 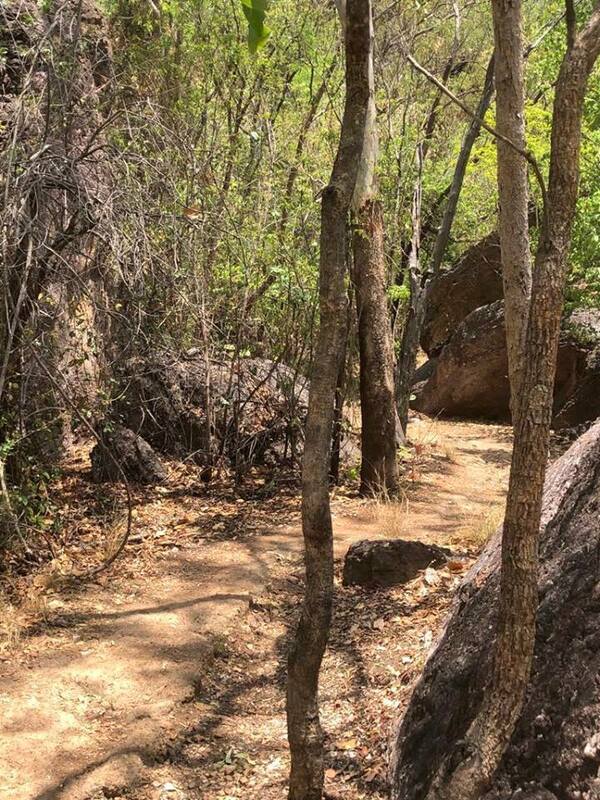 The walk is easy and wheel chair accessible. 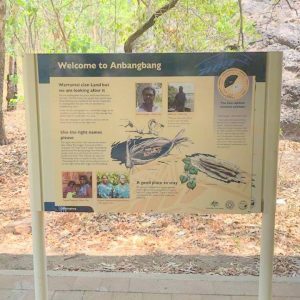 There are extensions to this walk, including Anbangbang Gallery where you can view the infamous Lightening Man and from here, the more adventurous soul can hike to the Gunwarddehwardde Lookout. 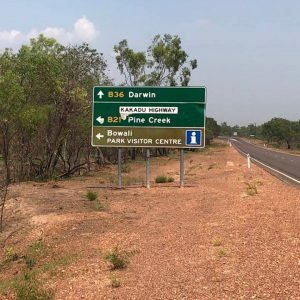 This lookout offers breathtaking views, looking back over Nourlangie Rock and the escarpment of Kakadu. 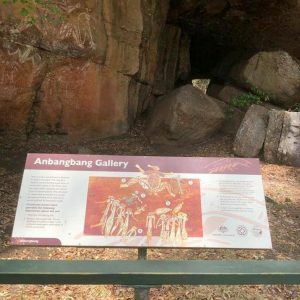 The Anbangbang Shelter is another extension along the Nourlangie Rock Art Walk. 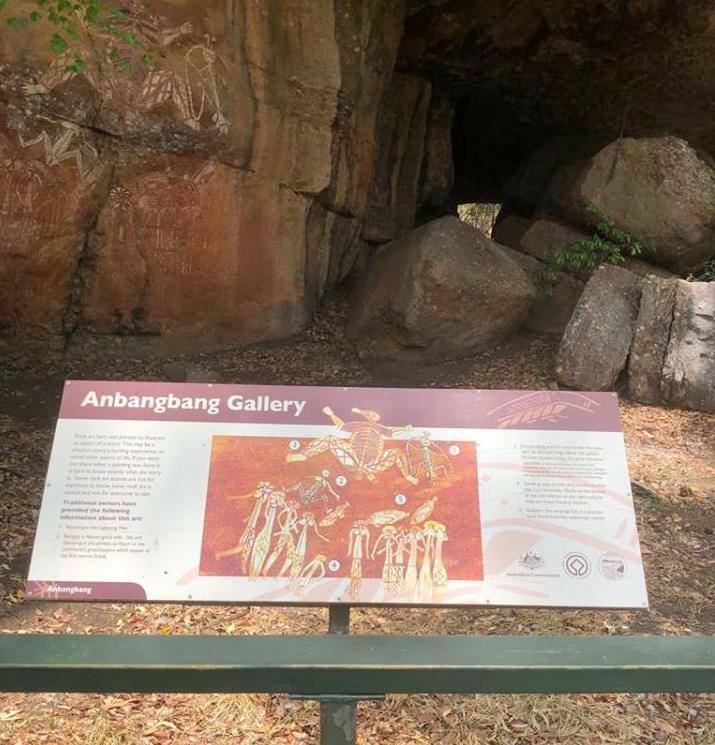 This site exhibits several more intricate paintings and, as its name suggests, is a rock shelter where aboriginal people took cover from the elements, made tools and told stories. 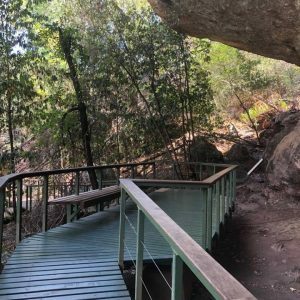 It is recommended to visit Nourlangie early morning to avoid the heat of the day or late afternoon as the sun is making its way down, exposing the ever changing colours of the Nourlangie rock face. Prior to entering the Nourlangie, a few kilometres back you will notice a turn off to Nanguluwur. 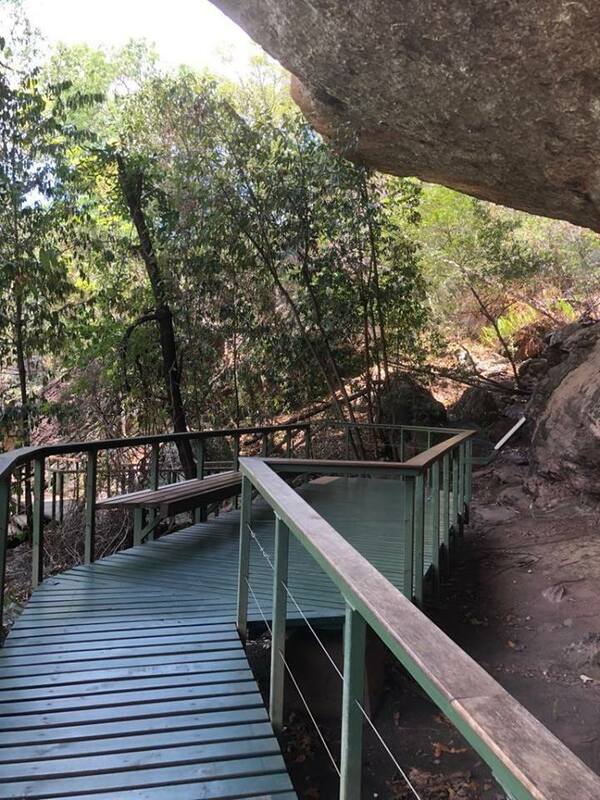 Naguluwur also has guided tours of this site each day throughout the dry season. 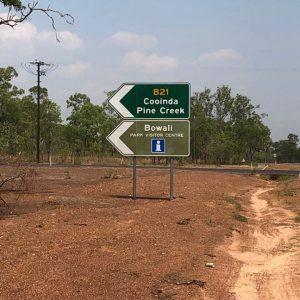 At the beginning of the tour people will congregate at the car park meeting place prior to commencing the 3.4 kilometre return walk. 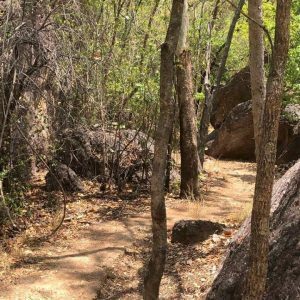 The walk is relatively easy, down a dirt track, however there is little shade so take plenty of water and sun protection. 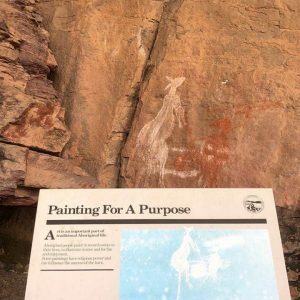 It is recommended to visit this site in the early morning to avoid the heat of the day and this is when the art site and cliffs are shaded. Nanguluwur is usually a lot less populated and you can really take your time to view and appreciate the significance of the art and its surroundings. 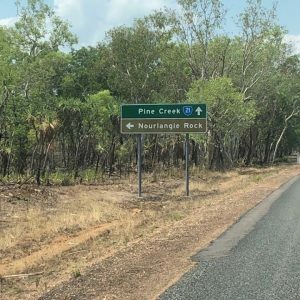 Distance: Nourlangie Rock Art Site is located approximately 52 kilometre’s from the township of Jabiru along a sealed road. 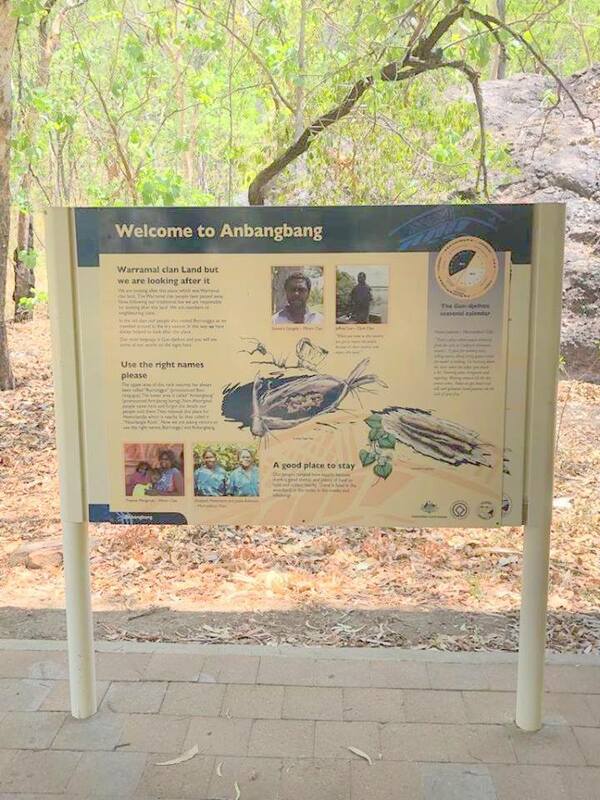 Guided Tours: Park Rangers offer guided tours at nominated times throughout the day in the dry season. 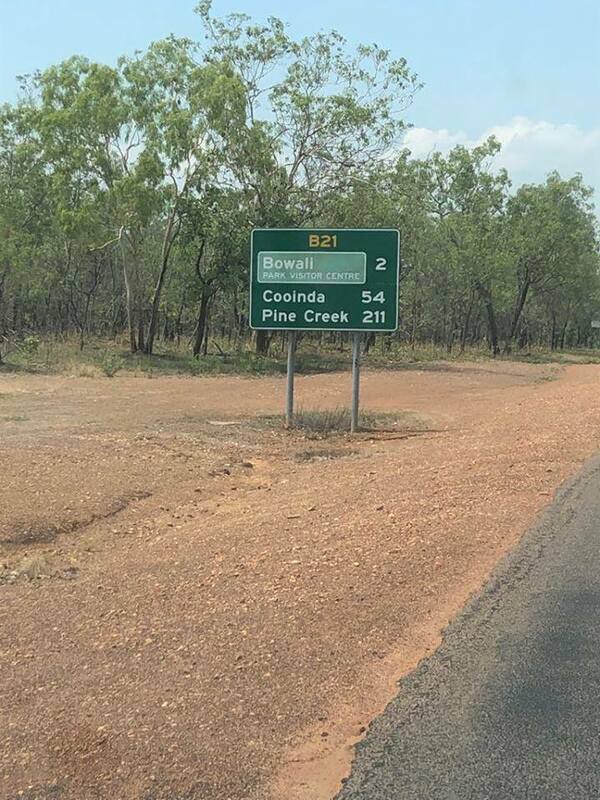 Check with Bowali Visitor Centre to obtain a schedule. 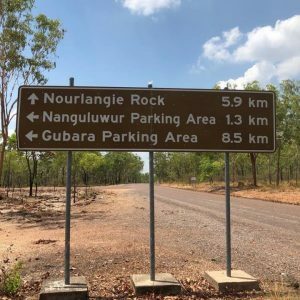 Facilities: Nourlangie Day Use Area includes car park, picnic tables, toilet block, Barbeque facilities, Coach parking. 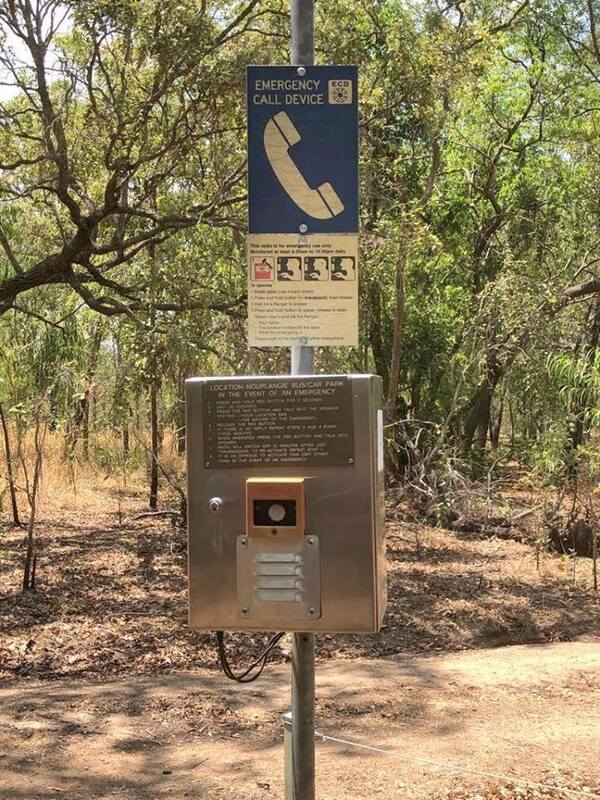 Please bring your own drinking water as tap water at Nourlangie is not drinkable.